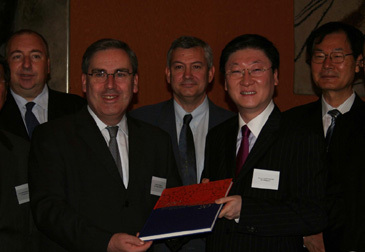 FKCCI President Philippe Li (second from right) is holding up the commemorative book with French Ambassador to Seoul Philippe Thiebaud (second from left) at a ceremony held at French Embassy in Seoul on July 12, 2006. FKCCI (French-Korean Chamber of Commerce and Industry) released a commemorative book titled "120 Ans De Relations Diplomatiques Franco-Coreennes & 20 Ans De La Chambre de Commerce Et d'Industrie Franco-Coreennes" on the occasion of the 120th anniversary of diplomatic ties between Paris and Seoul. The title of the book, which was published both in Korean and French language, translates into "120 Years of French-Korean Diplomatic Relations & 20 Years of FKCCI." The book was published jointly by FKCCI and Kyobo Book Centre with the help of FKCCI members and the French Embassy in Seoul to commemorate this year and to promote bilateral business relations between France and South Korea. FKCCI President Philippe Li and French Ambassador to Seoul Philippe Thiebaud pose with guests at a ceremony held at French Embassy in Seoul on July 12, 2006. The book, composed of four chapters, deals with stories on early French missionaries, French army involved in Korean War (1950-53), success of French enterprises, and famous people of both South Korea and France. The book will be on the market starting from July 14, 2006 at such major book stores as Kyobo, Youngpoong, Bandi & Luni's, main university book stores, and internet sites. A special ceremony for its publication was held at the official residence of French Ambassador to Seoul Phillippe Thiebaud between 11 a.m. and 1 p.m. on July 12, 2006. Local press corps was invited to the ceremony. 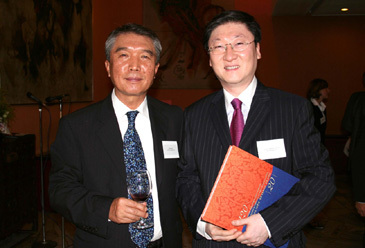 FKCCI President Philippe Li (right) poses with President Shim Woo-Jeong of KOFRAMC at a ceremony held at the French Embassy in Seoul on July 12, 2006. Scores of important figures of France and South Korea were invited to the ceremony. Among the celebrity participants from the French side were FKCCI President Philippe Li, Renault Samsung CEO Jean-Marie Hurtiger, Alstom Korea President J. Gordon Coming. From the Korean side were Chairman Lee Hee-Bum of Korea International Trade Association (KITA), President Son Kyung-Sik of the Korea Chamber of Commerce ＆Industry, Chairman Seo Jung-Ho of Ambassador Hotel Group, and President Kwon Kyung-Hyun of Kyobo Book Centre. The year 2006 is very meaningful to both countries. This year marks the 120 anniversary for bilateral diplomatic ties. The French-South Korean relations has steadily developed since the two nations initiated ties on June 4, 1886. 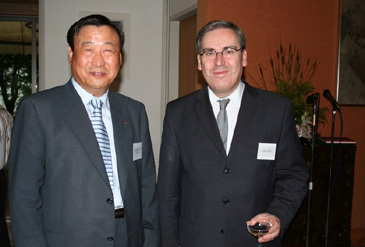 FKCCI President Philippe Li (right) poses with Chairman Lee Hee-Bum of Korea International Trade Association (KITA) at a ceremony held at French Embassy in Seoul on July 12, 2006. In 2004 President Roh Moo-Hyun signed an agreement on "comprehensive cooperation" with French President Jacques Chirac. This year marks 20th anniversary of FKCCI, which was established in Seoul in 1986. The main objectives of the FKCCI are to promote bilateral trade, investments between France and South Korea; and the relationships among the members of the FKCCI. The above photos were taken by Eva JA Lee, staff reporter. Miss Eva (JA) Lee serves as staff reporter of The Seoul Times. Eva majored in Chinese language and literature at Ducksung Women’s University. She also studied English in Australia. She covers diplomatic and foreign business community in Seoul. Eva likes watching movies as well as shaping her body at fitness club.